What is the Happy Cube? Happy Cube on the Internet. ... ... 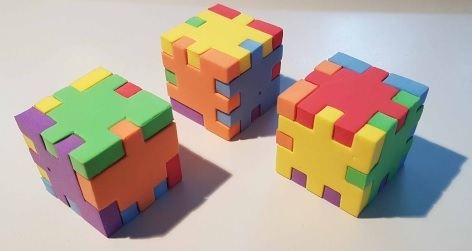 The puzzle Happy Cube consists of 6 mats of foam coloured blue, green, yellow, orange, red, and violet. Here you can see the blue mat. Each mat has six 5x5 pieces surrounded by a frame. Small cubes are cut irregularly along the edges. It is possible to put the six 5x5 pieces together to a 5x5x5 cube, if you find special positions. ... ... For each colour there are various levels of difficulty of solving. The blue mat is easy to solve, the purple one is the most difficult. The Happy Cube was designed by Dirk Laureyssens in 1986. It received several names such as the I.Q.ube, de Wirrel Warrel Kubus, CocoCrash and Cube-it. Further there are the Planet Cube, Snafu, Snuzzle, and Crico. ... 4'/5'16/2/3 You can number the six pieces from 1 to 6 on the front side. You can recognize the front side by a little circle in one corner on the left (blue: left up). You name the rear side of 1 1', corresponding 2' to 6'. If you find a solution, you form a base of the cube, which is a cross. Make sure that 1 is upright in the middle. Then the description is definite. You also number the other mats for the solutions. Notice the little circle on the left showing the front side. ... ... You can put together a figure of two cubes with the help of the blue and green mats. You take 10 pieces of 12. ... ... You can put together a figure of three cubes with the help of the blue, green and yellow mats. You take 14 pieces of 18. ... ... You can put together a figure of four cubes with the help of the blue, green and yellow mats. You take 16 pieces of 18. ... ... You can put together a figure of 2x2x2-cube with the help of all the 6 mats. You take 24 pieces of 36. 12 pieces are left. Theoretically you can build it with 5 mats. If you use 4 mats, you get 24 pieces. That is sufficient. But you can show, that you need 26 cubes for all the corners, but 4 mats only have 6*4=24 corner cubes. So it is not possible to form a maxi-cube with 4 mats. ... ... There is even a solution, which has the same colour on each side. ... ... If you want to build the figure on the left, first you have to put five pieces together to form four open cubes. The middle piece is at the bottom. (You have to keep the orientation in the space.) Then you form a ring of the four open cubes. At last you form two open cubes by the pieces on the very right and put them at the bottom and at the top of the ring. You take 30 pieces of 36. Six pieces are left. Jean-Marc Dubrunfaut was looking for a rectangle formed by all 36 mats in order to use a laser cutter. .... .. He found this 18x2 square. There is 36= 36x1 = 18x2 = 12x3 = 9x4 =6x6 and so perhaps there are five rectangles. Every piece has 4 edges. If you turn a piece, you have 4 more edges. You write down a pattern of an edge with a sequence of 0 and 1. This is a number with 5 digits in the binary system. If there is no little square, you write 0. If there is a little square, write 1. This method will be shown by piece number 4. In the drawing the number is related to the edge near to the number. In this way you can fix the number of the 6x6x4x2 = 288 patterns of the edges for all the mats in a chart. > Only 22 of 32 possibilities are used to form an edge (black letters). > All the pieces with x000x or x111x are avoided (red letters). > Patterns like x11xx, xx11x, x00xx or xx00x do not occur at blue and green. > Two pairs are the same, red4/blue3 und orange4/violett4. You find a cube easier, if there is symmetry. The main problem is making a cube with one colour. Students found all solutions by trying. I give only one drawing for one colour. Symmetric solutions are counted once. The blue and the green cube can be easily done. The blue cube is more difficult, because the pieces 1, 2 and 3 must follow in the same sequence for every solution. I would give the yellow cube the lowest degree of difficulty. The edges 00011 (piece 2) and 11100 (piece 3) fit together, piece 1' complete them to a half cube. Then it is not far away to the whole cube. It is very difficult to solve the purple cube, because you are often on the wrong track. 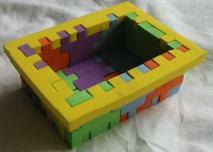 ... ... You can also form a mini cube of six pieces with different colours. 19 mini cubes with the distribution 3+3 (2 colours), 88 with 2+2+2 (3 colours), 21 with 1+1+1+1+1+1 (6 colours). 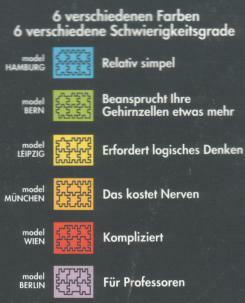 ... ... Benjamin Koch even found 41 solutions with six different colours instead of 21 with help of his computer. Snafooz is an American copy with six models. It goes into competition with the Happy Cube family. ... ... Snafooz is common in the USA. There are also six mats. A 6x6-square forms the side of a cube, not a 5x5-squares like at Happy Cube. ... ... 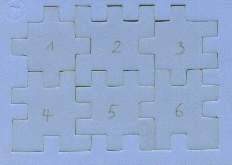 There is a puzzle from Japan, which uses a 4x4-square as a basis. The six pieces, which form a cube, show animals because of shape and decoration. The material is known from the rubber. That is what the pieces should be. My puzzle has only Japanese letters. In the article (1) you find, that you can read SEED, PLASTIC ERASER, MADE IN JAPAN on the plastic box:.